This place makes me happy even just thinking about it! I visited Slowpoke last Friday, which was also MY BIRTHDAY! I was already in a good mood, as one often is on their birthday, and I was lucky enough to be blessed with brunch accompanied by two of my favourite people in the world. The sun was shining, I was feeling the love. This place was a good choice. As was my meal! 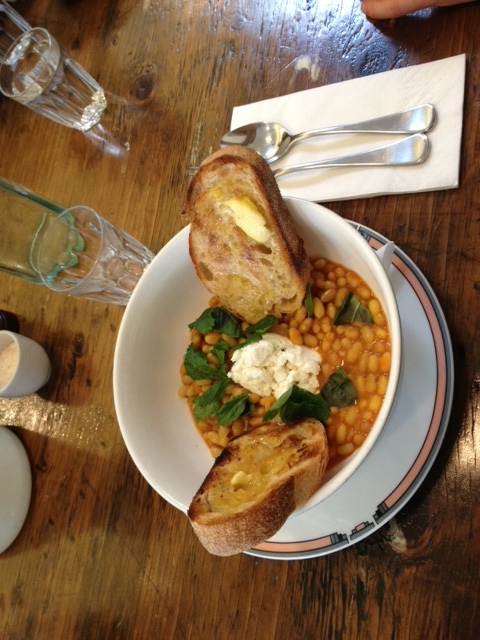 Baked beans with goats cheese, toast, and a ton of herbs. Bliss. I FEEL LIKE I SHOULD WRITE THIS ALL IN CAPITALS JUST TO EXPRESS HOW I EXCITED I WAS BY EVERYTHING, but I shall refrain. This place just has totally positive vibes about it, and the staff are really friendly. It was cold outside, but I was cosy. My other friend Jodie came to say hello WHICH MADE ME MORE EXCITED. It was my birthday, and everything was wonderful! The menu was simple, which was good. 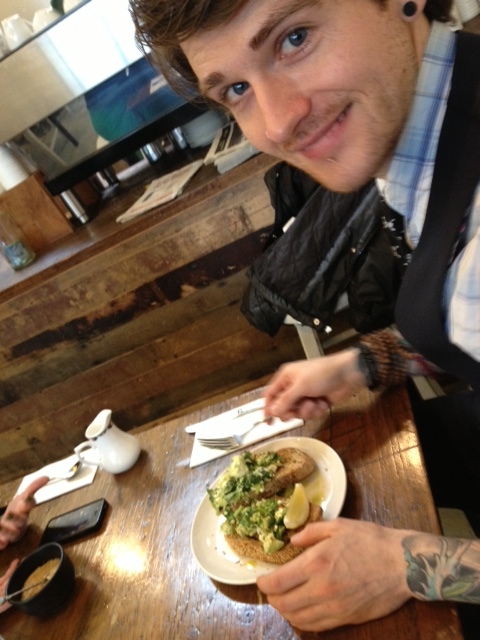 Thomas ordered Avocado Smash, and it looked incredible. It also had chilli in it, I never thought that could be a thing! I then ordered a cup of tea after my meal because I got really excited and ate it too quickly, and that was also amazing! Everything was awesome! 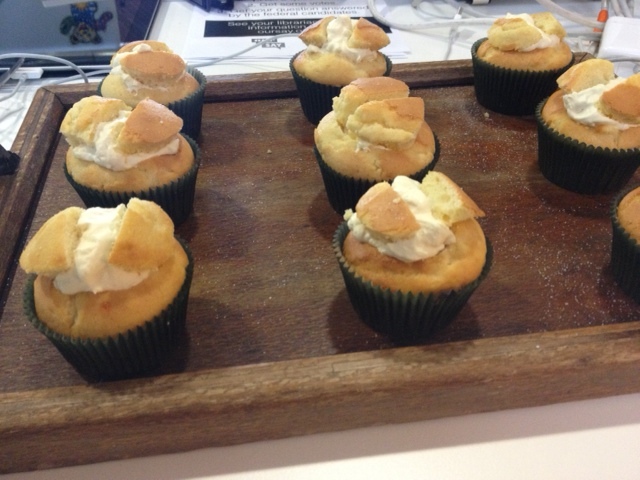 I then got to work to find these bad boys freshly baked, sitting on my desk. 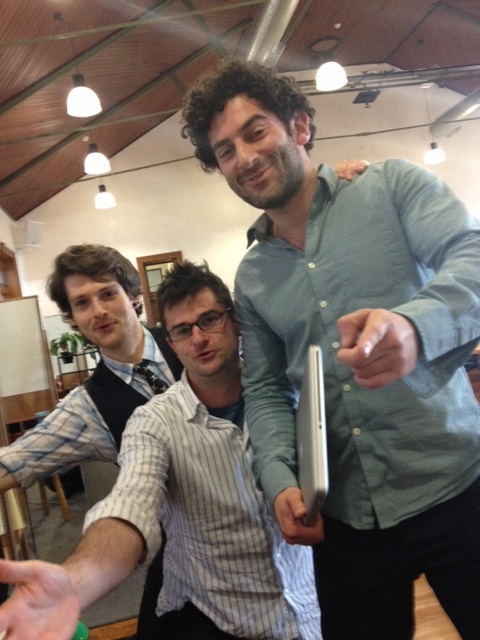 Then, two of my bosses (and Thomas) did their own rendition of Happy Birthday. It was a god day. I’m aware these extra birthday details are unnecessary in the scheme of #OccupieFitzroy, but I really don’t give two shits and want to share the awesomeness that was, my birthday. Door to Beard Index: Being the perfect Brunswick St cafe, it was high. Possibly even 1 step. Noms: AWESOME. Eat all the things. How poor will it make me? Standard amount of poor. Final thoughts: On any other day, this place would still have been pretty damn excellent. Check out their Facebook page!